Daniel Recital Hall - Productions Unlimited, Inc. | Productions Unlimited, Inc.
Daniel Recital Hall is the centerpiece of Furman University’s Daniel Music Building. 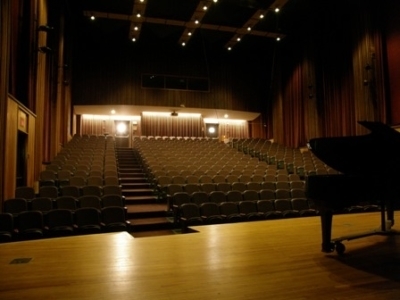 The hall, which seats 365, is in constant use hosting the music department’s rehearsals, chamber and solo music performances, opera performances, and being used as a multimedia classroom. Due to the extensive use of the hall and its lighting, Furman University chose to upgrade to LED lighting in an effort to make the hall more energy and financially efficient. Over the 2011-2012 semester break, Productions Unlimited, Inc. replaced Daniel’s 42 incandescent house lights with The Light Source’s LED 100-Watt Fresnel House Light. These LEDs draw 1/3 the power of the original 30-year-old house light fixtures and are 40% brighter. We also replaced the fluorescent fixtures at the back of the house with Color Kinetics linear LED fixtures, and the two recessed incandescent can lights with Cooper LED retrofit kits. Both of these fixture types are line voltage dimmable and are connected to the main dimmer rack. This upgrade will significantly reduce the amount of power used daily and will virtually end routine lighting maintenance in the hall. Over the stage, Productions Unlimited, Inc. replaced the oroginal 500-Watt tungsten fixtures with ETC Desire 110-Watt Lustr+ fixtures. Unlike the tungsten fixtures, the Lustr+ boasts x7 color mixing, creating clean whites and brilliant colors. These fixtures have added color to the traditionally “white” light stage without the need to change gels or leave the comfort of the control booth. PUI’s work did not stop with the lighting. 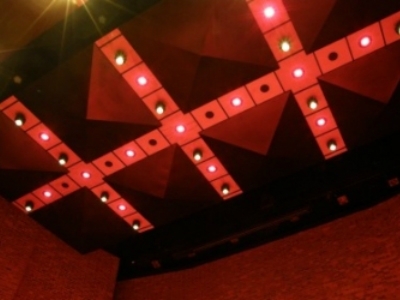 The hall has three ceiling panels that are height-adjustable in order change the acoustics in the room. We fully refurbished the original counterweight assist acoustic ceiling rigging system with new wire rope, eye bolts, sheave bearings, and performed a motor overhaul. We also replaced the aged motor control system with the first ever installed ETC Fixed Speed Motor Starter Control boxes as well as new four-position limit switches and potentiometers from Springer Controls. These new control components allowed us to install a new ETC QuickTouch Rigging Control Station to control the refurbished hoists and provide for height feedback and preset trim heights of the ceilings. We also replaced the unreliable stage lighting batten hoist with a new ETC Prodigy P650E unit with integrated raceway and cable management. 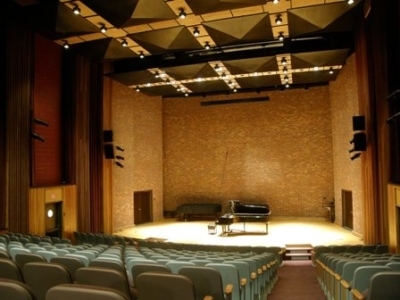 Daniel Recital Hall’s outdated architectural control system was replaced with an ETC Unison Paradigm System. This state-of-the-art system is easy to use and boasts a powerful processor designed to keep the lights on no matter what. Two LCD touchscreens were installed; one in the booth and one on the stage, and a single-button station was installed at the house right entry. The addition of this system to Daniel not only allows the peace of mind for 24/7/365 operation, but also allows easy control of the new lighting installation including the color mixing feature of the Lustr+. Lastly, we installed an ETC Emergency Lighting Transfer System as well as an Emergency Bypass Detection Kit in order to use some of the new LED house lights as emergency lights. 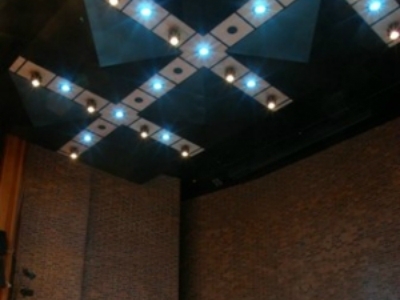 These upgrades should provide for many years of worry-free and energy efficient use of the Daniel Recital Hall.